This weeks post is a bit of a departure from the usual cocktail recipe and discussion. Instead I want to discuss something essential to so many great cocktails, which would not be terribly hyperbolic to call it the essence of a cocktail. What, at least in my opinion, distinguishes a cocktail from other tipples is that it contains ingredient (almost entirely alcohol) that edgily harmonize in a way that makes them more than the constituents, which frequently aren’t particularly palatable on their own (think gin). Frequently the edgy component is a concoction called “bitters”. Recently bitter liqueurs like Campari and Frenet Branca as well as bitters have become something of the rage. As proof Brad Thomas Parsons has written and entire book on the subject, and it’s wildly popular. A bitter, according to Parsons, is a mixture of flavors that includes main flavor or flavors and a bittering agent like hops or gentian root. 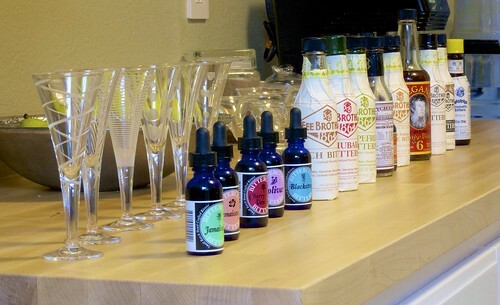 This distinguishes bitters from tinctures, essences or extracts which are typically only a single flavor or herb. By extracting from multiple herbs or combining extracts, the mixture becomes bitters. Originally bitters where potions concocted by traveling tonic salesmen, good for whatever ailed you, but early on clever bartenders realized that adding just a little bit to a drink made magic happen. The classic bitters that everyone thinks of, available in every liquor and grocery store is Angostura. For the span of a several decades it was also just about the only one that you could buy. Fortunately the cocktail resurgence has lead to a proliferation of quality bitters in all manner of flavors. In fact, I have a massed quite a collection, which led to a but of a problem of when to use each one. Some are easy. Angostura bitters is good for most cockails that just call for bitters and is the key to a Manhattan. Peychaud’s is critical for a Vieux Carre or a Sazerac. But what does one do with Cherry Bark Vanilla or Rhubarb bitters. B and I devised a way to begin to think about this conundrum. 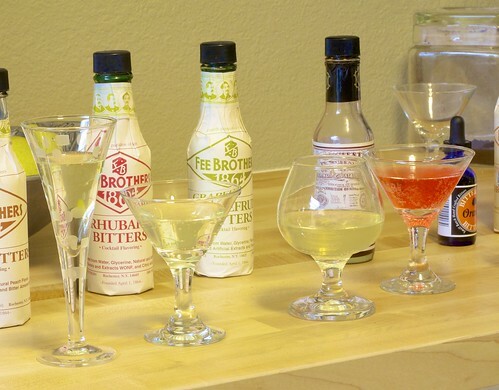 We put a small amount of selzer from our soda siphon in each of a series of small cordial glasses and then added about 6 drops or dashes of bitters to each glass. This seemed to work. The seltzer was a sufficiently neurtral background but diluted the bitters enough to make them more palatable. The first thing we noticed was that there was a tremendous range of intensity and complexity to the different bitters. Interestingly our favorite bitter was actually the venerable Angostura bitters. It had a really complex and intense combination of spice flavors that really seemed to work well. Peychaud’s was actually less strongly flavored and was really pretty unpleasant on its own, with a medicinal and possibly earthy kind of flavors. This probably explains why you really can’t substitute in recipes that call for Peychaud’s, plus it has a really cool red color. Don’t Squeeze, Use Fee’s) had been making an orange bitters since the early 60’s. In fact this was the first bitters other than Angostura that I got when I started making the Satan’s Whisker’s fifteen years ago. And bless them for keeping that ingredient alive, but this is where we made another interesting discovery. Turns out that Regan’s is a lot better. They both have an orange flavor, but that’s where the Fee Brothers stopped (it was a bit like baby asprin). The Regan’s was more intense and also had considerably more complexity from spices like cardamom and caraway. The Bittercube orange bitters, which came as a set of bitters that my Beer Trail-riding inlaws gave me one Christmas, was somewhere in between Regan’s and Fee’s in terms of complexity. Angostura now also makes an orange bitter, which I suspect is also very nice, but regrettably, I have yet to obtain. The orange bitters wasn’t the end of the problems for the Fee Brothers unfortunately. Most of their other bitters also really lacked complexity. The grapefruit, which is kind of a no brainer consider the bitterness of the fruit to begin with, had a disturbing Koolaid green color to it. They also make mint bitters that I initially thought might make a nice addition to mojitos. Unfortunately it was simply mint extract and propylene glycol as the bittering agent, which was ended up a lot like bitter Scope mouthwash. Sadly I wound up throwing that one out. Their Whiskey Barrel bitters was actually pretty good, tough it was a lot like (and almost as good as) Angostura. 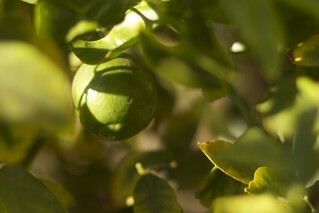 An unripe Myer lemon on our tree. The Bittercube bitters with Blackstrap and Bolivar and Jamaican #1 & #2 are interesting. They tended to be less intensely flavored, so I will wind up probably needing to use quite a it more (maybe a teaspoon or two per drink instead of a couple of dashes). Their flavors, though are very different and pleasant. I really do need to spend some time figuring out who best to use them. Stay tuned on that one. 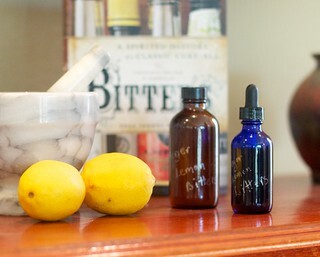 In reading Parsons’ Bitters: A Spirited History of a Classic Cure-All, with Cocktails, Recipes, and Formulas, I found a recipe for Meyer Lemon bitters. Hey, we have a Meyer lemon tree. A couple of months later, we have Meyer lemon bitters. They are pretty great. I have been playing around a bit with these as well. I have found a few uses, but I think a rif on the Bourbon Smash seems like it might be a winner, but we’ll talk more of that later. In the mean time, one of the definitely benefits of the cocktail revival is the availability of so many interesting bitters that just weren’t available a few years ago. Almost makes one forget about pumpkin pie vodka. Almost.